If your home or commercial facility suffers from a rat, flea, bed bug, cockroach infestation or any other vermin problem, get a local pest control in Knowsley with Fantastic Pest Control. Our procedures involve a proven pest management process, which usually includes four phases: survey, treatment, observation and post-service actions. The local, certified pest exterminator in your area will come to identify the type of pest and the scale of the infestation and then, he will proceed with the treatment in a safe and effective manner. In emergency situations, just get in touch with us right away and we will send out a nearby exterminator to see to the problem without delay. 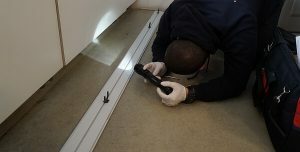 Each pest control service in Knowsley starts with a careful property inspection. The goal is to locate the pest's hideout and see how advanced the infestation is. This will help your local exterminator to evaluate your case and choose the most effective approach of extermination. The different pest species have different habits. For bed bugs, the pest officer will keep special attention to the bedroom and upholstery; for rats and mice, he will check around the kitchen and other frequently visited areas. No matter the issue, your technician will be able to pinpoint the pest at question and choose how to proceed. Your Knowsley exterminator will proceed with the pest treatment immediately after inspecting the area. > For mice and rats, he will seal entries and place bait stations to knock-out the rodent population. > For wasp nests he will sptay the nest with a powerful insecticide in a powder form which will knock-out the little buggers. Each pest is treated differently. You can learn more about that on our website or by contacting us. Most pest problems such as bed bugs, rats and mouse infestations require several visits from a local pest officer. This is because of their life cycle and adaptability but rest assured, no intruder will be able to escape our potent treatments. With our guaranteed pest control, you can request additional visits that will eliminate the pest colony and will rid you of the problem. You can schedule your follow-up pest control in Knowsley at any time by contacting us. Of course, you'll want to prevent further problems with annoying insects and scavenging rodents. All exterminators are knowledgeable and will give you handy tips on how to do just that. Additionally, your pest controller can install rodent proofing tools to protect your home or office even further, just request it over the phone or in person. If you've booked a heat treatment, the exterminator will apply a powerful residual product right after the initial treatment. This way your property will be protected against further insect problems for many months to come. Our rat and mouse control in Knowsley includes the application of powerful but pet-safe pesticides and proofing of entry points with wire and sealants. This combination works great against the pesky rodents and destroys them quickly. For our rodent removal, we use powerful bait products that work quickly throughout an infestation. In addition, you can order a professional disinfection service with us to ensure that no remnants from the rodent activity are left behind. For a successful bed bug removal, we recommend that you book one of our guaranteed options. This is needed because bed bugs are an adaptable and resilient pest, so we will use the most powerful insecticide on our first visit in order to tackle the infestation at large. And on the second and next visits, your local expert will apply a residual product that will ensure you won't be having bed bug problems in the future. Wasp nests are not to play with. So, don't attempt to get rid the wasps by yourself and entrust the task to your local wasp nest exterminator in Knowsley. He will consider the job as an emergency case and will arrive to neutralise the aggressive stingers quickly and effectively in a matter of minutes. We have one more option if you suffer from a severe bed bug infestation - our heat treatment procedure. It aims to destroy insects with a 100% success rate and is done by using special heaters. Your local pest controller will come around to heat treat your home against bed bugs, fleas, flies, moths, carpet beetles and more. The insects don't stand a chance! You can take advantage of a fast response and quick arrival for a heat treatment as well. So don't wait for the insect colony to grow before calling us!